It's no secret that Americans have a tendency to lead a sedentary lifestyle. With the baby boomers quickly approaching or have already hit the age of 60, it is more important now more than ever for seniors as well as those approaching their senior years stay active. With exercise known to help boost the immune system, increase joint function, improving mental acuity, prevent disease, maintain weight and help improve the overall quality of life in seniors, it’s important that seniors get up and stay active. Not sure where to start? 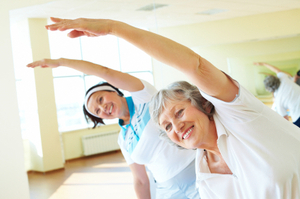 Here are some trends that SeniorHomes.net has noticed that have taken the over-60 exercise enthusiasts by storm. Yoga. Yoga has become increasingly popular over the last 10 years and the popularity continues to grow within the senior community. The sequences of stretching and poses used in yoga can help to tone and build muscle. For seniors, yoga can also help to lessen arthritis pain, improve joint flexibility, lower blood pressure and can serve as a relaxation aid, which can lead to a better night’s sleep. The popularity of yoga in the senior community has become so popular that yoga classes are popping up around the country designed specifically for the aging population. Water-based exercise. Swimming, water walking and water aerobics are low-impact exercises that hose a wide-variety of benefits for senior citizens. Benefits include improved cardiovascular health, better balance, reduced stress levels and a decreased risk of developing osteoporosis. Swimming and water aerobics are excellent choices of exercise for seniors because they are easy on the body and place little to no stress on the joints. Community pools, gyms, senior centers and many YMCAs offer senior swimming or water aerobics classes. Tai Chi. Tai Chi is a relaxing, meditative exercise that can help build strong core muscles and relax tense muscles in the body. Tai Chi is low –impact, which can make it ideal for senior citizens just beginning a workout routine. Tai Chi can help with arthritis pain, lowering blood pressure and enhancing mental acuity as well as concentration. Tai Chi is even used to help dementia and Alzheimer’s patients. Walking. Walking isn’t exactly anything new or trendy. With walking, senior citizens can stick with the tried and true. Walking is one of the best ways to help improve overall health, increase stamina, maintain heart health and tone muscles. Many citizens, boroughs, towns and even malls have walking clubs for senior citizens. Walking is an excellent activity that can be completed rain or shine and is safe for virtually everyone. Whether a senior citizen is exercising for the first time or is just trying to keep up with an exercise routine as they age, exercise doesn’t have to be hard. Senior citizens can find an activity or two they truly enjoy and stick with it. Exercise is one of the keys to aging gracefully.